Category three referees will be fourth officials at SPL games this weekend. 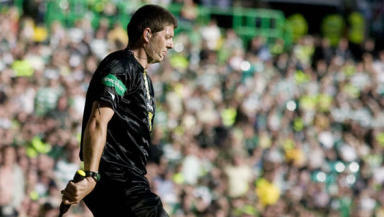 Scottish referees have been appointed to act as fourth officials at three Scottish Premier League fixtures this weekend. The category three referees will work with teams of foreign referees who have flown in to cover games due to the strike by top flight referees. The grade three refs will be working at the Celtic v Inverness Caledonian Thistle and Hamilton v St Mirren matches on Saturday, as well as the Dundee United v Rangers fixture on Sunday. Match officials are being flown in from Luxembourg, Portugal, Israel and Malta to ensure that the SPL, Scottish Cup and Alba Cup matches go ahead this weekend. Luxembourg’s Alain Hamer has been asked to “double up” and cover two SPL matches on successive days. Scottish category three officials Stephen Allan, Stuart Macaulay and Andy Tait will provide support to their foreign colleagues. Allan will be at Parkhead for Celtic’s match against ICT, Macaulay at New Douglas Park for Hamilton’s clash with St Mirren and Tait will work Sunday’s game at Tannadice between Dundee United and Rangers. The category one referees announced on Sunday that they had agreed to refuse appointments for this weekend’s fixtures in protest against recent criticism and fears for their safety. Category two officials were in support of the move but referees at a lower level were not in attendance. Senior Scottish Football Referees Association official James Bee, a category three referee himself, sent an e-mail to all refs at that level on Tuesday, the Daily Record reported. He told the whistlers that they were at liberty to accept appointments if they wished. The e-mail stated: "At a meeting on Sunday the category one referees took the decision to withdraw their availability to officiate at matches this weekend. "The following competitions are affected - the SPL, SFL, including the Alba Challenge Cup Final and Scottish Cup replays. The decisions of the category one and two referees were not taken lightly and must be respected. "Unfortunately we have so far not been able to formally consult with the category three SAR referees. Please accept the apologies of the SSFRA for this and bear in mind I am also a category three SAR Referee. "Until that time the position is as follows - category three and category three SAR referees: 1, Have not been formally consulted. 2, Are at liberty to officiate at any match they are appointed to this weekend if they so choose. 3, Can choose to support, or otherwise, the stance taken by category one and two refs."